The requirement on organisations with over 250 employees to report on their Gender Pay Gap (GPG) is starting to raise some interesting issues. The latest amongst these is a survey carried out by BMG Research for the Equalities and Human Rights Commission. 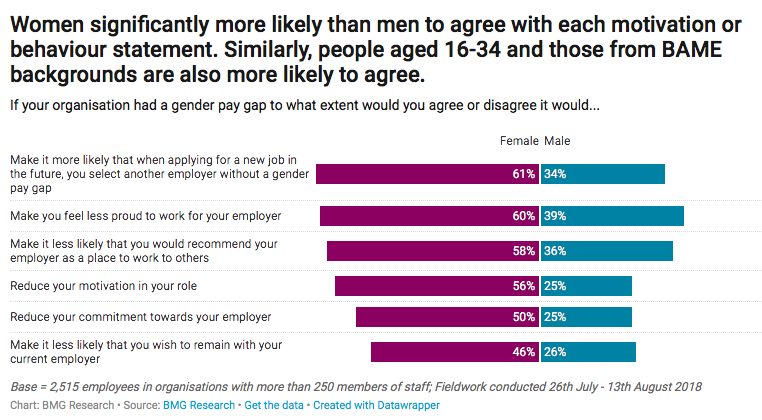 Nearly two-thirds (61%) of women agreed that if their organisation had a gender pay gap it would make it more likely they would select an employer without a gap. And more than half (58%) agreed it would make them less likely to recommend their employer as a place to work. More details in the chart below. It seems that those surveyed (men as well as women) were just asked about any GPG, not one of a particular size. So in the pharmaceutical sector, GSK has a pay gap; but this is minimal – about 4% – compared with others in the sector, which are often around 20%. So some discrimination would have been helpful, rather than just asking about a GPG tout court. Nevertheless the report gives a warning that employers are going to have to pay more attention to the values of their staff, who actually have views on the kind of outfit they want to work for. The Paula Principle’s main argument is that women are running increasingly ahead when it comes to qualifications and competences, but are not appropriately rewarded for these. So it’s pretty simple: if employers want to recruit well, they need to make sure their profile is consonant with the values of the most competent. GPG figures for a single year do not tell the whole story. Organisations are – some of them – developing better approaches for recognising and rewarding competence, and these will take time to mature. But they need to be visibly on the way.